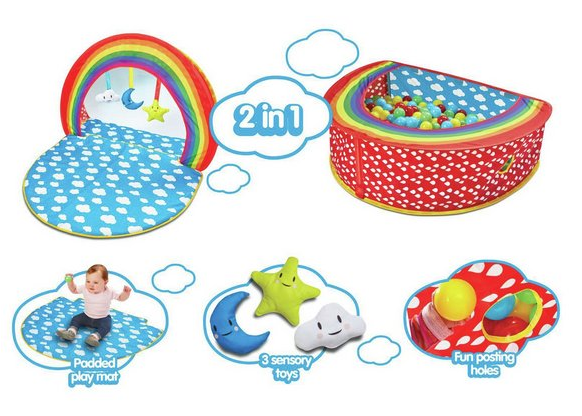 When you baby is little this can be used as a regular baby play gym with a detachable padded washable mat and an overhead rainbow arch. It includes three hanging toys in the shape of the moon, a cloud and stars with squeaker, crinkle and rattle sounds. As your baby starts to sit up you can transform it into a ball pit for them! That makes it amazing value for money as well as meaning they can continue playing with it well past the baby stage. It has gorgeous bright colours and will fold down flat for storage as well. If I had a baby I would be snapping this up straight away! You can reserve and collect for free from Argos stores, or home delivery costs £3.95. Should keep Neil occupied for 5 minutes! ! Oh Santa might need to get this! maybe a good option for the van?